2. 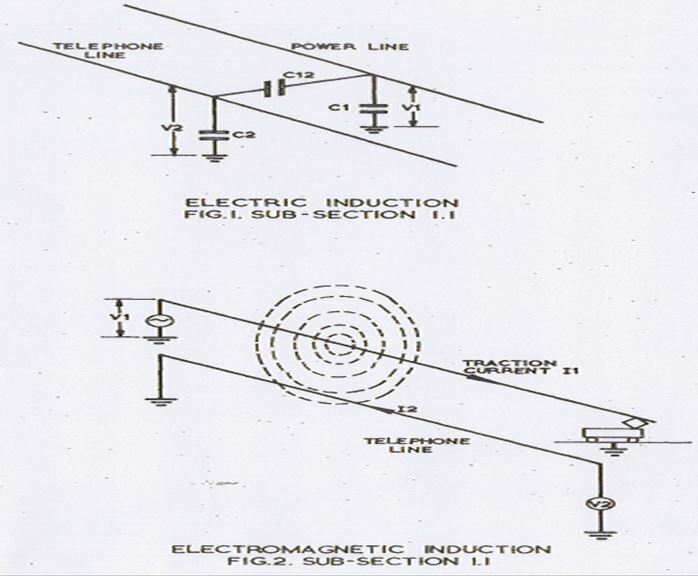 Interference due to – Conduction, Electric (Electrostatic) and Electromagnetic induction. 3. Visibility and Location of Signals. 4. 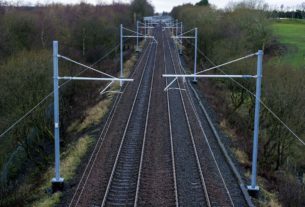 On non‑electrified sections, signals are located so as to be clear of standard, moving dimensions and to afford maximum continuous visibility to Drivers of approaching trains. 5. On electrified sections, the masts, insulators, wires etc. obstruct the visibility of signals. Conduction covers the possibilities of coupling via earthing points or direct contact between power line system and a communication circuit conductor. Direct contact is rare with telecom cables. 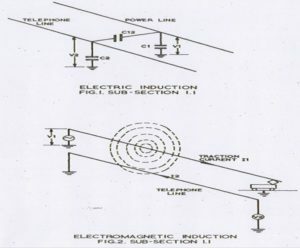 Electric induction (or electrostatic induction) is the effect of contact wire or power line voltage although strictly it is due to attraction and repulsion of charges on the conductors. Coupling involved is capacitive. Around a conductor maintained at a high A.C. potential, there is an alternating electric field. The distance to which this field extends depends on the voltage, the condition of the surrounding atmosphere, the presence of earthed structures in the neighbourhood etc. The electro‑static field emanates from the positive charge and ends at the negative charge unlike magnetic lines of force, all of which form closed circuits. Any conductor that exists within the field will get charged. In another words, the power conductor and the S&T conductor in the vicinity can be deemed to have small capacitance to earth and between themselves, the magnitude of these capacitances depends on the physical separation, atmospheric conditions etc. – parallelism or the distance over which the catenary and S&T circuits are parallel. The power developed will be least when the S&T circuit is perpendicular to the catenary. The magnitude of the voltage induced in the S&T conductor under the influence of the traction wire, depends on the relative position and not on its length. The voltage induced electrostatically in an overhead line situated at a distance of 10 metres from the track was calculated to be about 3000V. If the parallelism of this line is 1 KM and if some one were to touch this line, a current of about 4 milliamps will flow through the body of the person. This would give ‘a nasty shock. If the value of the current is 15 milliamps, it would prove to be fatal to a person. 1. Any current carrying conductor produces magnetic field around it. Alternating current produces magnetic field that is alternating. Thus, A.C. traction sets up an alternating magnetic field. 2. Any conductor linking with these magnetic lines of force, has a voltage induced in it according to the well known “Faraday’s Law of Electromagnetic Induction” which states that “Whenever the, number of lines of force linking with a circuit changes, an e.m.f. is induced in the circuit proportional to the rate of change of flux”. 3. The magnitude of the induced voltage is also dependent on the current, the distance of separation, the surrounding medium etc. 4. When the entire outward and return current is restricted to two conductors located physically close to each other, the induced voltage on a third conductor due to each one of these will cancel, leaving a resultant which is very nearly zero. 5. 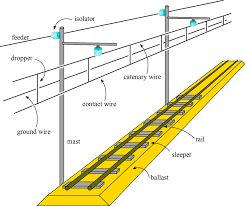 In the case of an A.C. traction system, the current drawn from the power sub‑station by a locomotive is fed through the catenary and is returned through the rail system. 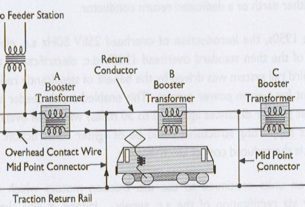 If all the” return current passes through the rails, the resultant induced voltage in a‑conductor in the vicinity will be negligible. However, in practice this is not the case. 6. The return current passes from the wheels of the locomotive and from the rails, a portion of the current passes through the ballast into the earth. Some of this portion penetrates deeply into the earth, some leaves ‘the earth to find a path in other rails, cable sheaths, metal pipes and similar conductors parallel to the track. Ensure that interference from Traction system cannot, under any circumstances, cause signalling system to exhibit false clear indications, or in any way imperil safe operation of trains. Ensure that signalling equipment continues to function normally in the presence of traction current. Minimize the danger to life from electric shock, derived from traction system.